From 5 to 7 September 2018 the 12th Central Asian International Exhibition "Textile Machinery" – "CAITME 2018" was held in UzExpoCenter. CAITME is the largest international specialised textile machinery exhibition in Central Asia and CIS countries. Based on many existing customers in Uzbekistan, Suntech displayed the latest running Warp Beam Storage System model. 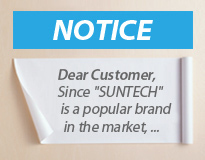 Suntech attracts many new customers from the local market as well as the neighboring countries and several orders has been confirmed at site from Bahmal Group.